One of the scenarios which popped up in Aggressors: Ancient Rome Steam workshop not too long ago is called "Centurion". Its creator is a fan of an old-school strategy game of the same name released in 1990. As I am a big fan of this strategy game myself, I gave it a try and it instantly become one of my favorites. It is a great work and I had much fun playing it. Let me introduce you to Mogilan who created this scenario, and the journey of its creation in his own words. One of the scenarios which popped up in Aggressors: Ancient Rome Steam workshop not too long ago is called "Centurion". 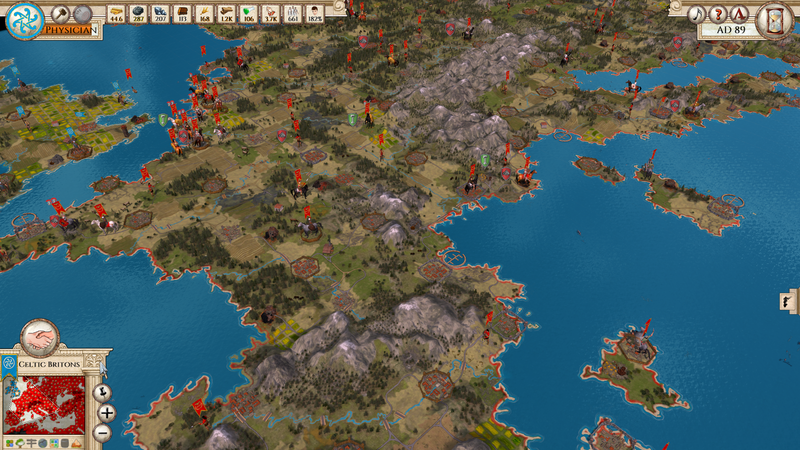 Its creator is a fan of an old-school strategy game of the same name released in 1990. As I am a big fan of this strategy game myself, I gave it a try and it instantly became one of my favorites. It is a great work and I had much fun playing it. Let me introduce you to Mogilan who created this scenario, and the journey of its creation in his own words. I’ll keep it simple, as I don’t want this text to be too boring. I was looking for a game set in the Ancient Era and Aggressors: Ancient Rome attracted me with its simplicity and resemblance to the Civilization series. I bought a game and finished the tutorial, the Simple one. I loved the game, the feel and settings. Graphics are also very nice – neat and clean. Not overloaded with useless 3D fireworks – every serious strategy gamer should appreciate this. But I didn’t like the map to be limited to Mediterranean: where is Gallia? Or Britannia? A quick decision was made to go straight into modding to fix this. I wanted a bigger map, and there is a very nice Map builder attached to the game. I took me 5 minutes to figure out how it works (without watching or reading any dedicated manuals). What map should be used if the whole European theater needs to be covered? Luckily I’m a great fan of classic Centurion, and remembered that this game had a perfect map which covered all most interesting regions from the Roman Era. I found a gameplay of this game on Youtube, made a screenshot of the map and converted it into an Aggressors map using the Map Builder. The result was much better than expected, but required some polishing. I placed some forest here and there, mountains and rivers… of course everything had to be historical and of strategic importance (did you know there are reports on the internet on historical forestation of Europe?). Alps had to be difficult to cross, rivers had to be natural borders, and some wild, less populous areas [during those] times covered by thick forest. Fertile Crescent? It needs to be fertile, so more rivers and grassland should do the job. The “Change Map Pattern” option of the editor was really useful in making the map look more realistic. You can make straits or shores look more natural. I used it a lot to form better looking Bosporus and islands. But what about resources? That’s tricky. Remember, the game needs to be balanced, so the numbers and placement of the resources had to be decided with care. But you know, Aggressors’s main scenario has been balanced so well by its developer. Why not rely on tested solutions? I counted the number of resources in some randomly generated games and main scenario and came with 25 as a number of mines of each type on the map. I aimed to place them evenly on the map but also considered the strategical importance of some regions in that Era. So islands got some resources to make the invading effort worthwhile. Also historically, some regions like Egypt, Italia, or Asia Minor were richer than others. That’s why excess of gold was placed there. 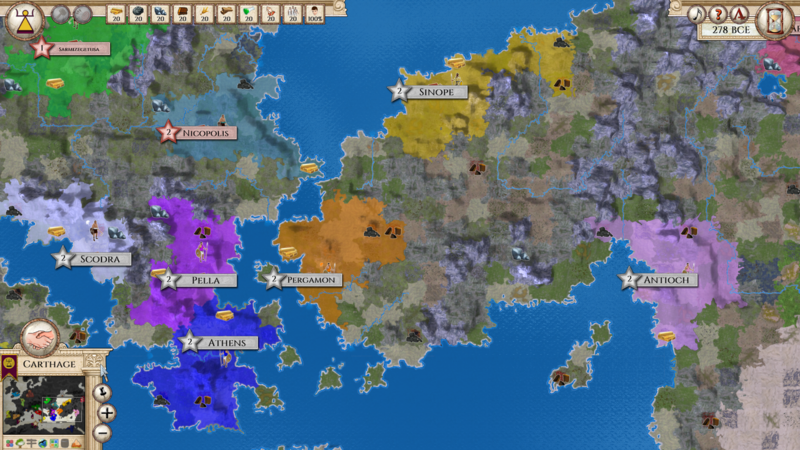 Of course, the main scenario has 20 factions – this is the number to stick to if I want to keep my game balanced. More factions would need more resources… that’s too difficult for the time being, so let’s keep 20 factions. 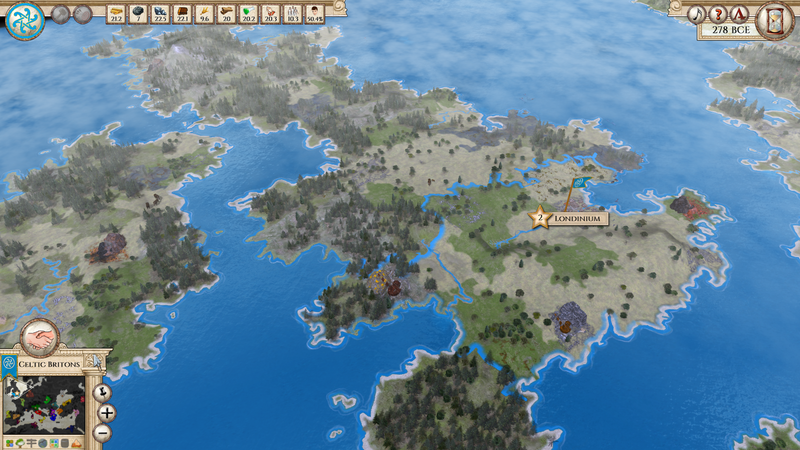 I located the civs around the map so that every civ has some room to expand. Unfortunately, I had to delete Epirus (as the Balkans were too crowded) but added Boii instead (as the Romans didn’t have a natural enemy to the North and it would be too easy for them to expand). Adding factions is difficult at first as it requires delving in the code. But if you are familiar with languages that use tags (like html or xml) it should be much easier. Besides, Pavel, the developer and the community are very helpful and accessible and can explain everything. In fact, Googling for and then adjusting appropriate graphics (flags, leaders, coats-of-arms) was the most time-consuming part of the adding and modifying factions phase. The last phase of preparing the scenario was the calibration. I wanted the scenario to well balanced. It was difficult to achieve because starting nations, by design, were not perfectly balanced. I wanted to see strong Rome, strong Carthage but weak Britons and Armenia. That’s why Rome starts with bigger capital and tons of resources nearby and Carthage starts with cities on two continents. 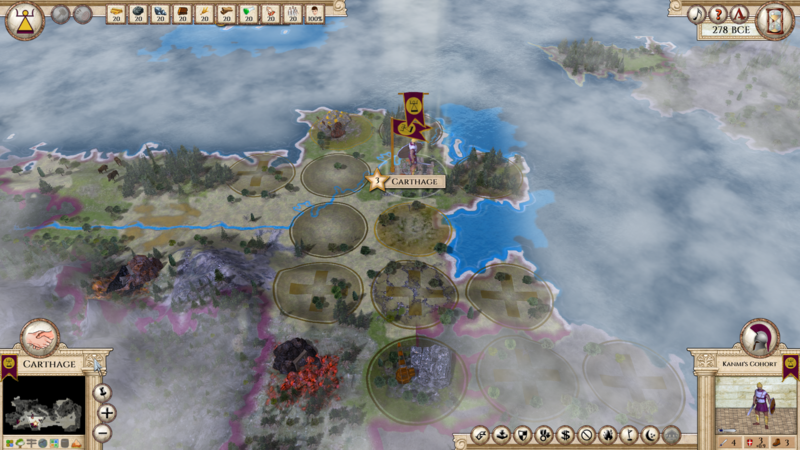 So in order to ensure that the scenario will be highly replayable but with few historically strong civilizations to provide the challenge, I had to allow the AI to play it alone with no interference from my side. A few such games helped me to assess the game’s balance, and after few tweaks to starting positions of civilizations and resources locations I finally achieved satisfactory results. My mod/scenario met with very positive reception. 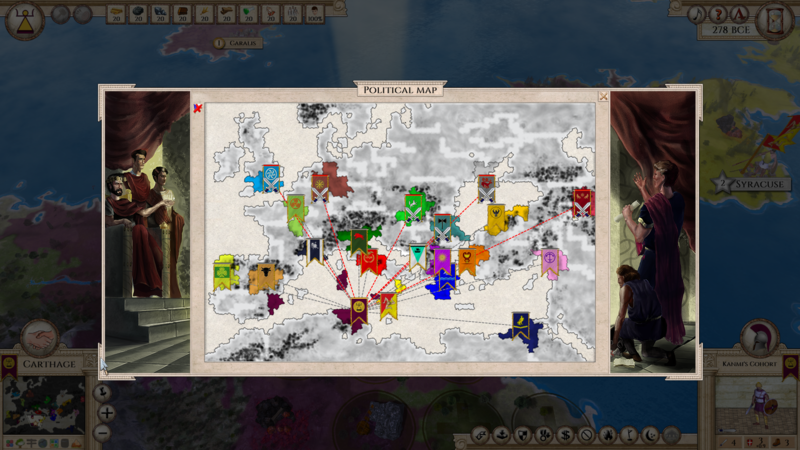 Players praise the dynamic of the scenario – factions need to trade extensively to expand and this had impact on relationships. They do tend to form then leave Federations very often, so diplomacy is of more importance. It was something that I aimed for so I’m happy with the results. However, I still see a lot of room for improvement in this scenario. For example, I’d like to balance starting positions even better or add more factions. But for now overhauling the graphic side by adding more terrain types or improving images would be the next step. Don't hesitate to try it out here. I can also recommend the video history replay of my own game below.